Flabby Patty Cook – From SpongePedia, the biggest SpongeBob-wiki in the world! The Flabby Patty Cook is an alter ego of SpongeBob, who just appears in the episode The Other Patty. 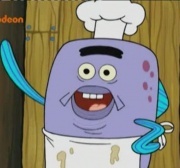 He sells Flabby Patties in the restaurant The Flabby Patty. SpongeBob invents the Flabby Patty to bring Mr. Krabs and Plankton closer again. At the end of the episode, where SpongeBob says he's the Flabby Patty Cook, Plakton and Mr. Krabs chase after him. The Cook is a violet fish with light blue arms. He just has one eyebrow and he wears a white cooking hat. This is really just Spongebob in a costume. This page was last modified on 26 August 2014, at 12:27.